This document details about the struggle an apartment community had to face and eventually how they got the khatha. It also list out few suggestions for getting khatha faster and in a transparent way. The apartment falls in Mahadevpura constituency and Bellandur Ward in Kasavanahalli area. ARO office for the apartment complex falls in Marathahalli BBMP office and JC/DC office falls in Mahadevapura BBMP office. i.We did the groundwork of understanding the khata process from Citizen Matters post, BBMP site and Sakala website. Below are the links that I referred. i. Ours is a 48-flat apartment. So, we initially thought of running a pilot of four flats and see the reaction from bureaucrats. We went to BBMP ARO office, Marathahalli at 10 am on June 6th 2015, Saturday. Below are the happenings in the office for nearly four hours. We submitted four applications along with all the supporting documents to the caseworker. We requested the officer to tag our applications with Sakala. The officer requested us to approach the Revenue Inspector(RI) for the same. In the meantime the caseworker told that “sub-number” information was missing from the list of documents that we had submitted. 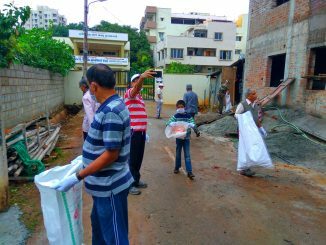 We were clueless about what it was and who is supposed to give it, whether the builder or the BBMP. We asked the caseworker, but did not get a clear answer. However the officer accepted all the four applications and gave an acknowledgement of receipt of applications and also made an entry in a BBMP record book. We met the Revenue Inspector (RI) and informed him about the submission. He again told that we need to submit sub-number information. We asked him what the sub-number was. He told that our builder should be providing it and asked us to reach out to builder. He also told us that we have to submit EC and Attested Sale deed of all the flats. We explained him that we have many owners who are staying outside Bangalore, but RI was adamant that we submit EC and Attested Sale deed of others. When asked about tagging application with Sakala, RI told that Sakala’s timeline is 45 days and BBMP time line is 30 days for khata processing and that he can get khatha well before 30 days if all the documents are produced. We knew that RI was not justified in demanding EC & Attested Sale deed of all the flat owners when only four of us have submitted the application. But we had to get something called Sub number list, which is not even listed in BBMP site. ii. On the same day, we checked with our builder on Sub number and he said that he does not know anything about it and told that he has handed over all the copies of flat oriented documents to flat owners including copy of OC. Our builder is a start up builder and our apartment being his first project. So, he was not aware of this khata specific document. iii. In the evening, I got a call from BBMP Tax collection officer from my area (Kasavanahalli). He told that he was sitting next to RI and that if we give 8 lacs for 48 flat, he can get our khata done. I told him that I will revert. iv. As we were suspicious about RI’s intent of demanding documents of other owners, I mailed Arathi Manay, the author of the khata application post on Citizen Matters. Through her I got a contact of some activist who was already working with BBMP for simplification of khata process. v. I mailed the activist on the issues that we were facing and they forwarded the same to BBMP Admin at that time, Vijay Bhaskar, IAS. The admin on the same day appointed a Sakala officer to oversee our submissions till we get khata. vi. On June 8th 2015 RI came to our apartment and meet the builder’s manager and asked for a bribe of Rs.5000 per flat. Manager told that he would get back to him. vii. We complained the Sakala officer about RI’s demand on documents of other flat owners. Sakala officer followed up with RI and though he questioned that it was not fair, but finally RI justified him that as a part of process, BBMP needs it. Though Sakala officer was also not that convinced, he told us to cooperate with RI. viii. After getting a pulse of 1st day experience in BBMP, I decided that instead of getting EC and Attested Sale deed from other owners, better to have others also apply for khata. So, I coordinated with other flat owners and started getting others ready for application. ix. The coordination with other flat owners was one of the toughest in the entire exercise. I had to exchange more than 200 emails with others, coordinate for sale deed attestation for all and also take the pain of taking photocopies of 11 documents listed above with help from another owner. If we two had not taken the initiative; it would have easily taken 2-3 months for all the owners to get ready for submission of application. We were able to get everybody ready in 10 days. x. A couple of us made a trip again to the BBMP office on 13th June, to meet the revenue inspector, to understand the expectation of Sub number information as that was the only document we were not having and not sure what it was. He was again not giving a clear picture. Then we thought of escalating to ARO, but while we were discussing with revenue inspector, ARO left to Mahadevpura office for a meeting. xi. We came back next week on June 20th to get clarification on sub-number information. This time the revenue inspector clarified what exactly a Sub number is, by showing a sample of another apartment. xii. So, the Sub number information turned out to be details about the Flat Number, Owner name, super built up area, undivided share and property tax payment details of all the owners. xiii. Since ours is just 48 flats, we were able to get the details prepared ourselves. xiv. By 21st June, we had all the documents with filled in application forms ready for submission. On 26th June, we submitted 38 more applications taking the total to 42 submissions. We got acknowledgement for all the submissions and the entry was made in BBMP record books. Six other flats in our apartment were unregistered and not sold by the builder. i. From here onwards, we got good support from Sakala officer. He frequently called revenue inspector and others patching us in the call and put pressure on him to expedite the processing now that all the documents are provided. Sakala officer put relentless pressure on the caseworker, RI and ARO. ii. It took at least 5-7 trips to BBMP office to make the case workers to complete their job and push our files to RI’s desk. Sakala officer had also followed up with these caseworkers over phone. Finally, they completed their work on July 16th. iii. Revenue Inspector reviewed our application and reported to us that in some of the sale deed copies, stamp duty pages were missing. He then came to our apartment for inspection. He told to our manager that the photocopy of the blueprint was not of good quality and demanded a fresh copy. Builder immediately handed over another copy. But again he told that the copy was not of good quality and he cannot see it clearly. But we were all able to see it clearly. So, he demanded that we produce the original blueprint within 24 hours, else our application processing would get significantly delayed. iv. The next day, we submitted the original of blueprint and also missing pages of sale deed of a few owners. v. Revenue Inspector further delayed, but Sakala officer kept the pressure on him and finally on July 23rd, pushed our application to RO (Revenue Officer) BBMP Mahadevpura. vi. Towards July end, met the Revenue Officer. He was irritated that there is already a Sakala complaint. He finally said he will complete his job in three days. i. We waited till 1st week of August and the file was still with him. We then had to make 3-4 trips to meet him and also Sakala officer followed up with him multiple times over phone. Eventually, he shouted at us when we met him and said that he is on election duty and could take up our case only after 22nd August. So, our applications went on to hold till early September. We met the Revenue Officer around 10th of September, 2015. This time he said we have not submitted Sub number list. We told him that we have already submitted Sub number list to revenue inspector. But he didn’t listen. So, we took the help of Sakala officer. He patched RI, RO and us on call and RI confirmed that he had received Sub number list from us and maybe it is with Tapalu section of Mahadevpura. i. We made a couple of trips to trace the officer in Tapalu who was holding the Sub number list and other documents. Sakala officer had to follow up more than five times to ultimately find the officer and requested the officer to produce the required documents to RO’s desk. ii. We followed up with RO’s PA to check if documents reached RO’s desk, but RO’s PA kept maintaining that it did not reach RO’s desk. On the other side Tapalu officer told us that he had already forwarded. We somehow sensed that RO’s PA was lying. One day we stood in front of him for 20 minutes and finally he confirmed that the file was with RO. PA was definitely expecting bribe, but understood our persistent stubborn attitude and finally gave up. The scene of us standing before RO’s PA will be etched in my mind forever – it represented the sad state of people involved in public service in India and how common man is being harassed and impacted. iii. We followed up with RO and he told us that he will process the application and forward it to DC (Deputy Commissioner). iv. After five days we followed up with RO and he said that he has already processed our application and he is not aware where the file is. v. We followed up with DC’s PA, but he confirmed that file has not reached DC. Then we met DC and he helped in locating the file. It was back in RI’s office Marathahalli. vi. We again followed up with RI in Marathahalli and he said that the file is being reviewed by the ARO. We asked if there are any remarks. But he didn’t give the clarity. After following up with RI 3-4 times directly in BBMP office, came to know that Revenue Officer wanted to do site inspection. vii. Within in three days, the revenue officer along with revenue inspector did the site inspection. viii. After one week, ARO forwarded the file to RO. i. On October 3rd, RO finally forwards the file to DC. This time we got confirmation from DC’s PA.
ii. On October 7th, DC returns the file to ARO Marathahalli. iii. We followed up with ARO to find out the reason why the final was returned. After meeting several officers making 2-3 trips to BBMP office, got to know that the DC wants to do inspection. iv. From here onwards, the file never moved. We followed up with RI close to 10 times, but the DC never came for site inspection and RI was blocking us not to meet DC as he is a senior officer and should not pressurised. Around mid of November, the revenue inspector got transferred to Hoodi location. With new RI in place, there was further hold on our application as new revenue inspector had many other things to do on priority. I came to know through an activist that Additional Commissioner BBMP is planning to hold a walk-in where we can report any khata related issue to be held on December 7th. i. Three of us in our apartment got ready with a request letter, all the acknowledgements we received and a record of all the interactions with complete details. ii. On December 7th, we met Additional Commissioner. We showed her everything and requested her to expedite our case. In front of us, she ordered the JC and assured us that BBMP will get back in two weeks. iii. On December 14th, the revenue inspector for Marathahalli came to our apartment and handed over khata approval notice for all the 48 flats. He also requested us to hand over DDs for khatha certificate and extract. He told that he will come to our apartment and collect DDs. iv. As we were not confident of RI coming to our apartment to collect DDs, we collected all DDs and handed over them to him in BBMP Marathahalli office on December 22.
v. On December 31st,, we got a call from revenue inspector saying RO/ARO will be coming to our apartment to hand over khata and requested all of us to be available. On January 1st, RO, ARO, RI and bunch of caseworkers came to our apartment premise and issued khata. As finally they had to issue khatha without taking bribe, they took photos while handing over khatha, so that they can showcase to their seniors. This is how we got khata, a six months journey with more than 30 trips to Marathahalli and Mahadevpura office put together! Once you submit your khata application, on the spot demand for tagging the application as Sakala. The applicant should be handed GSC number and the same should come in as SMS to your mobile. This is a tracking number which can be applied in Sakala website and you can track the progress of application processing at the comfort of your phone. If you get resistance, straight away escalate to ARO. If ARO does not listen, then complaint to JC (don’t go for DC). Whenever you get resistance from these officers just put a word that you will report it to th Additional Commissioner/ higher officials. In our kourney we took the help of Sahayaa also. They provide temporary relief, but soon they get off-track the next day itself. Sakala is far more effective. I personally believe that RTI for khata issues are very ineffective and a waste of time. The bureaucrats are now intelligent enough to give smart answers and get away. Some of the mandatory documents for khata applications include OC, Updated EC, property tax payment receipts, Betterment charges receipts, Attested Sale deed & copy of blueprint of approved plan. BBMP’s mystery document – Sub number List!!! BBMP officials try to confuse applicants by asking for Sub number list. This document is nowhere listed in BBMP site nor Sakala site. Also, officials do not tell promptly what the document is all about. They take advantage of this confused situation of applicants and seek bribe. Sub number document is listing of Flat number, Owner name, super built up area, Undivided share, whether rented or owner occupied & property tax payment details in tabular format. Residents, fed up of people who throw garbage outside, get down to work and deal with the stink! Now they’re sure those who saw them working won’t throw waste on streets. Court cases and unrest apart, BBMP is widening 23 roads in areas that were formerly BDA layouts. Work has begun and is expected to finish in a year. Newly elected Mayor and the Deputy Mayor spell out their plans for the city. But do they have the capability and powers to execute these plans or will they be the yes men for the state government? Thank you Sir for so much information. Its sad to see the apathy and harassment the common man has to face from the corrupt and vile officials. As i read through your post i was growing so furious. i’m just holding back my abusive words for those animals. They make our lives so miserable. But people like you give us the courage to face them and fight for our rights. thank you Sir for inspiring us. We also want to get khata registered for our Apartment and would like to consult some one who has done it. Would you be available for a consultation. We have a lot of doubts in the first place which we want to get clarified and also would like to know the way forward. Please do let me know. Sakala doesn’t deal with bifurcations. The web site doesn’t say it either. Don’t get mislead.